Dr. Peter Nosco has recently returned from his sabbatical over the last year in Japan and has published a new book this summer via Cambridge University Press. 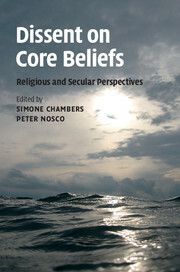 The book, co-edited with Dr. Simone Chambers of the University of Toronto, is titled Dissent on Core Beliefs: Religious and Secular Perspectives and compares the ways in which nine ethical and religious traditions have dealt with intramural dissent. Co-sponsored by the Centre for Japanese Research and the Department of Asian Studies.